Chinese Farmer's Calendar software is mainly designed for people who want to find the lucky days of their special events, such as marriage, by using their astrology birth charts for any coming years. The Chinese Farmer's Calendar covers from year 1900 to 2200 with 24 time zones. That means people own the software don't have to buy annual Chinese Farmer's Almanac books anymore. Also, people don't live in China time zone can have Chinese Farmer's Calendar calculated using their time zones. The Chinese Farmer's Calendar provides advanced Feng Shui application using Purple White Nine Flying Stars to tell people their money luck, romantic luck and wisdom luck areas in the house by selecting any year till 2200. The software also includes the Baby Gender Prediction and Baby Lucky Name selection with Five Elements option. There are many very good tools for the professional Chinese fortune tellers in the software. The Chinese Farmer's Calendar software can run till 2200 with free software upgrade, it can be used more than two generations in a family. 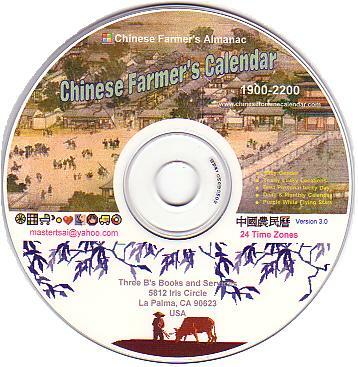 Every Chinese family and the family using Chinese Farmer Almanac once for a while should own a copy of the Chinese Farmer's Calendar software.